Do I have to move in on move-in day? Students have been assigned a time to move in, but it is not mandatory to move in during this time. Students may move in after regular move-in hours or on a later date. Those that plan to move in after classes begin should notify the Housing Office via email at housing@sfsu.edu. International, Graduate and Student Athletes are sometimes required to move in early. If you are not in one of these groups, but would like to move in early, please log into the housing portal and click on “Early Move-In”. The Express Check-in Process allows students to speed up the check-in process by checking in partially online through the housing portal. After completing the online form, students will be issued a 'Boarding Pass', which they will be required to show (either a printed copy or on their mobile device) at check-in on their assigned Move-in day. Students may begin checking in online as soon as 5 days prior to that date. For questions about the online Express Check-in process view the 'Move-in Process' page or contact the student housing staff at housing@sfsu.edu. How Do I get to campus and where do I park? Please see the campus Parking and Transportation website for directions and general parking information. Parking in the Stonestown Galleria Mall is prohibited and all vehicles will be towed. For long term parking students and families will be able to use Parking Lot 25 free of charge on assigned move-In days only. Can I borrow a moving bin on move-in day? San Francisco State is partnering with the nation's largest professional student move-in company, University & Student Services (USS), to assist our students on move-in day. Professional moving bins will be available on the top floor of Parking Garage 20. Please Note: Students must provide their Student ID in order to check out a bin. Students can retrieve their IDs when they return their bin to the same location (must be within 2 hours). Can someone help me move in? 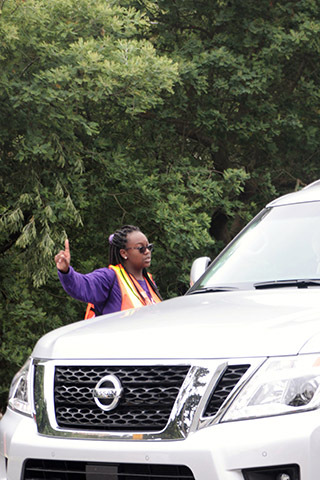 San Francisco State volunteers and University & Student Services (USS) staff will be available on assigned move-in days to assist parents and students unload belongings. Can I send a storage pod to campus? Unfortunately, there is not have enough space on the campus grounds to accommodate storage containers. Can I mail my possessions to San Francisco State? Please do not have your items arrive before you do. We are unable to store items for students who have not checked in. You should arrange for packages and other mail to begin arriving after move-in day. When is the Housing Office open on move-in day? Can I pick up my San Francisco State ID card on move-in day? Housing requires that students have their San Francisco State ID card (OneCard) at the time of check-in to expedite the process. If you do not have your ID card on your assigned move-in day you can pick it up from the OneCard office or provide a State identification card when checking in. More information about SF State ID cards can be found at the OneCard website. When does my meal plan start working and when/where can I eat on move-in day? Meal plans included in the License Agreement will be activated the morning of your assigned move-in day. Dinner is available for purchase for family and friends on move-in day. All meals are offered at City Eats unless otherwise noted. All mail should be addressed to the resident's legal name and include the last 5 digits of their San Francisco State ID #. How do I set up my internet? This information will become available within a week or two before move-in day. What do I do if I lock myself out or lose my keys? Proceed to the Community Front Desk of your assigned building to request a temporary key. Proper ID will be required to confirm identification and occupancy. Temporary keys are loaned out for no more than 72 hours. If the temporary key is not returned within this timeframe, an automatic lock change may be initiated for security purposes and a $50 fee will be charged to the resident's account. If the lock change is initiated, locks/keys to the resident's room and mailbox will be changed and all residents (where applicable) will be notified to pick up keys at the Resident Services Community Desk. Residents are allowed ONE courtesy lockout per semester. Any subsequent lockouts will be deemed excessive and for safety reasons, may warrent a lock change at a cost of $50/lock change. Excessive lockouts may also require residents to verify possession of room keys and/or a meeting with the Area Coordinator for Resident Services. April 19, 2019 2019 – 2020 Housing Application closes for returning residents.